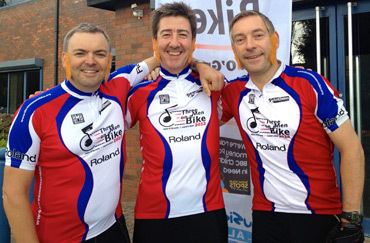 The Three Men on a Bike Charity Ride is due to begin in John O’Groats this Friday, hopefully concluding 926 miles later at Land’s End on Sunday August 26th. The riders will be setting off tomorrow for John O’Groats, conducting last minute preparations and prayers before embarking on the 926-mile bike ride on Friday. The Three Men will also be joined on various stages by riders from Bonners, Dawsons, Digital Village, Gear4Music, PMT and Paul McManus, the MIA’s Chief Executive. Print article This entry was posted by admin on August 15, 2012 at 10:25 am, and is filed under Uncategorized. Follow any responses to this post through RSS 2.0. You can leave a response or trackback from your own site.